The enslaved men interviewed wanted so badly to let their families know they were alive that they wanted reporters to use their names and faces. But, the reporters knew their sources could be killed for talking. This dilemma soon became how to best tell the story of slavery without endangering their sources. McDowell and Martha Mendoza accepted Friday the 2016 Anthony Shadid Award for Journalism Ethics at a ceremony. Esther Htusan and Margie Mason were also part of the reporting team on “Seafood from Slaves,” which uncovered slavery within Southeast Asia’s fishing industry. The also was awarded the 2016 Pulitzer Prize for in Public Service. 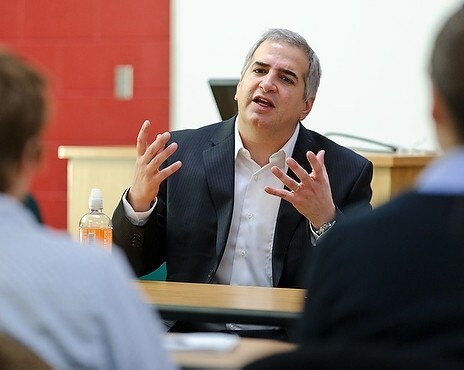 The Shadid award, which is presented by the Center for Journalism Ethics, each year recognizes stories that maintain high ethical standards while serving the public interest. The award is named in memory of Shadid, an alumni who died in Syria while reporting for the New York Times. Shadid committee chair Jack Mitchell said the winning story exemplified careful, ethical journalism. “Good journalism is journalism that worries about what stories will mean to those who are involved in the story,” he said. Focusing on those involved in the story was central to the AP’s reporting. As the team told the stories of men who were kidnapped and tricked into slavery, they knew it was important to protect their sources. Mendoza said they called their editors and presented them with their limited options. They could not blur the faces because it is against the AP’s guideliness. They could use silhouette footage, which wouldn’t show the desperation of the men’s faces. Or, they could try to free their sources. The women then got in touch with contacts in immigration services, and freed the men who helped them tell their story. The awareness created by the story has freed even more slaves, led to dozens of arrests, seized millions of dollars of seafood and alerted the U. S. Congress to loopholes in federal laws that have allowed slave produced seafood to end up on American plates. While the story exposed corruption within the industry, there is still much to be done, according to McDowell. Throughout writing the story, Mendoza said the team of reporters had many ethical conversations with their editors, as they were concerned whether the story was becoming one of advocacy journalism. “When we went to our editors and said this might be happening, the answer was: ‘If you think there are slaves there you have a moral imperative to go look,’” Mendoza said. While their editors decided it was ethical to advocate against human trafficking, they didn’t allow Mendoza to accept invitations to Congress or the Vatican. Accepting these invitations would put her in a position of advising policy, she said. The impact of the story on the industry contributed to its Pulitzer Prize win last month. But, McDowell and Mendoza, both of whom had worked with Shadid at the Associated Press, said the this award meant more to them. Carly Schesel, originally from Chippewa Falls, is a sophomore double majoring in journalism and political science.